All Categories Accountability Systems Incident Command Boards Tags Mobile Command Center and Boards Locker Signs and Holders Firefighter Awards & Plaques Acrylics and Glass Awards Plaques Statues Trumpet Awards Perpetual Plaques Clocks Trustee Watches Axes & Axe Plaques Firefighter Axe Plaques Presentation Firefighter Axes Light Weight Axes and Plaques Firefighter Wedding Axes Pulaski Tools and Pike Poles Law Enforcement / EMS Awards Law Enforcement EMS Awards Badges & Insignia New Badges Commendation Bars Blackinton Badges Smith & Warren Badges Quick Ship Badges Hat Badges Wallets & Cases Medals Namebars Service Pins Collar Insignia Tie Bars & Tacks Breast Cancer Insignia Gifts and Signage Banquet Ideas Engraved Gifts Full Color Gifts Padfolios Firefighter Gifts Firefighter Jewelry EMS Gifts Law Enforcement Gifts Nametags Signs Sports Awards Honor Guard & Memorial Castings & Components Chiefs' Corners Illinois Chiefs' Corner Wisconsin Chiefs' Corner Wisconsin Fire Service Admin Assoc. Why drink warm wine from a boring glass when you can keep it cool and fresh in an insulated stemless wine cooler? This cooler comes in a var..
New! 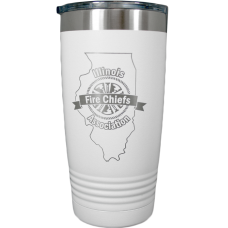 This 20 ounce stainless steel tumbler features double wall vacuum insulation -- twice the thermal insulation of the average plasti..
New! This 20 ounce stainless steel tumbler features double wall vacuum insulation -- twice the thermal insulation of the average plastic tum.. Perfect for keeping your daily commute free from coffee or tea spills, this 20 oz. 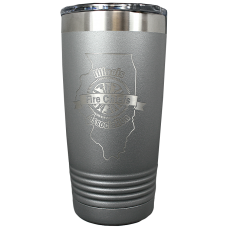 Travel Tumbler would be a great gift for anyone. With an ..